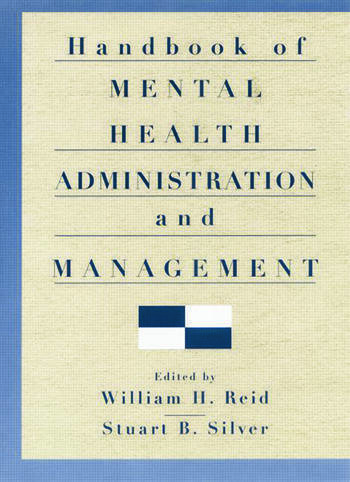 William H. Reid, M.D., M.P.H., is the former Medical Director of the Texas Mental Health and Mental Retardation System and Chair of the National Council of State Medical Directors. He has been a senior manager in many mental health settings, and is past president of the American Academy of Psychiatry and the Law. He is currently clinical or adjunct professor at three Texas medical schools and lives and practices in Horseshoe Bay, Texas. Stuart B. Silver, M.D., is the former Director of the Mental Hygiene Administration of the State of Maryland and past president of the National Association of State Mental Health Program Directors. Currently, he is Clinical Professor of Psychiatry at the University of Maryland School of Medicine and Chairman of the Board of Directors of Clinical Associates, PA, a multi-specialty medical group.